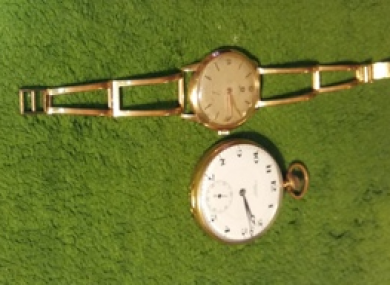 Some of the watches which were stolen. POLICE IN ANTRIM have appealed for information following the robbery of two premises in the Glenavy area of ANtrim in which a significant amount of expensive jewellry was stolen. The PSNI said that it believes these properties were entered sometime between 1.00am and 8.00am on Tuesday 2 January. A quantity of jewellery and cash (sterling, euro and dollars) was stolen from a house. Items from a nearby store for horse riding equipment were also stolen. A saddle, stirrups and a double bridle were stolen from the adjacent store for horses. Spokesperson for the, PSNI, Constable McElroy would especially appeal to owners of jewellery shops or antique stores to be on the look-out for anyone who may try to sell any of these items to them. He said: “If anyone has any information about this stolen jewellery and horse riding equipment please make contact with Police at Lisburn on the non-emergency number 101, quoting reference 250 02/01/18. Email “Cartier watches, a platinum ring and 13th century golden letter sealer among items stolen in Antrim burglary”. Feedback on “Cartier watches, a platinum ring and 13th century golden letter sealer among items stolen in Antrim burglary”.